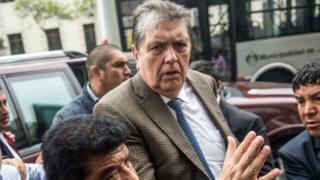 Former Peruvian President Alan Garc�a has died after shooting himself as police arrived at his home to arrest him over bribery allegations. Mr Garc�a was rushed to hospital in the capital, Lima. His death was confirmed by current President Mart�n Vizcarra. Mr Garc�a was accused of taking bribes from Brazilian construction company Odebrecht - claims he denied. Interior Minister Carlos Mor�n told reporters that when police arrived, Mr Garc�a asked to make a phone call and went into a room and closed the door. Minutes later, a shot rang out, Mr Mor�n said. Police forced the door open and found Mr Garc�a sitting on a chair with a bullet wound to his head. Mr Garc�a underwent emergency surgery in the Casimiro Ulloa hospital in Lima, but to no avail. In a post on Twitter, Mr Vizcarra said he was "shocked" by the former president&apos;s death and sent his condolences to his family. Mr Garc�a served as president from 1985 to 1990 and again from 2006 to 2011. Odebrecht has admitted paying almost $30m (�23m) in bribes in Peru since 2004. But Mr Garc�a maintained he was the victim of political persecution, writing in a tweet on Tuesday that there was "no clue or evidence" against him. A gifted orator, he was described by some as "Latin America&apos;s Kennedy"
Four of Peru&apos;s most recent presidents are all being investigated for alleged corruption, with a fifth - Alberto Fujimori - serving a prison sentence for corruption and human rights abuses. The current leader of the opposition, Keiko Fujimori, is also in pre-trial detention on charges of taking $1.2m (�940,000) in bribes from Odebrecht. Published on Wed, 17 Apr 2019 16:11:34 GMT, © All rights reserved by the publisher.